The Shape of Water review: "A timeless, fantastical and forceful fable of outsider love"
Del Toro’s Valentine to boundary-crossing love pours from the screen in ravishing torrents of feeling and style. And Hawkins is sublime. Even before you factor in his love for ghosts, fauns and kaiju, thick currents of feeling have always run through Guillermo del Toro’s finest films. Consider Federico Luppi’s poetic longings in The Devil’s Backbone, Hellboy’s love for Selma Blair’s Liz Sherman, or the weeping heart of innocence lost in Pan’s Labyrinth. It’s no strain to call del Toro’s films love letters to cinema, either. At best, they double as declarations of devotion to the belief that film can seduce and transform across boundaries. Those rivers of feeling overflow in his tenth film, an impassioned musical romance brimming with evidence of deep directorial conviction. True, recent del Toro workouts Pacific Rim and Crimson Peak also stretched beyond their monster-movie and melodrama roots thanks to his unfiltered investment. But The Shape of Water is the director at his purest, surfacing as an English-language (and sign-language) extension of Backbone and Pan in its fulsomely imagined period allegory of outsiders resisting the tide of historical oppression. 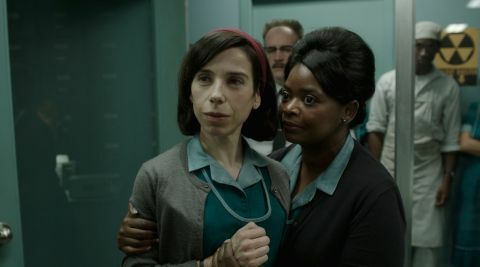 For Backbone’s orphan hero and Pan’s inquisitive Ofelia, substitute Sally Hawkins’ mute Elisa, a lonely but life-loving cleaner who lives above an old-school film palace in 1962 Baltimore and finds escape in movies, music and moments of bathtub bliss. Meanwhile, her outsider bonds with potty-mouthed fellow cleaner Zelda (Octavia Spencer) and gay neighbour Giles (Richard Jenkins) receive full expression in del Toro and Vanessa Taylor’s character-rich script. At another extreme sits Colonel Strickland (Michael Shannon), who we meet as he delivers an ‘asset’ for containment to the government facility where Elisa and Zelda work: a creature (Doug Jones) from a black lagoon, deemed to be of Cold War interest. After a shocking, bloody episode reveals our amphibi-man enjoys neither imprisonment nor torture, Elisa forms a bond with him based on Benny Goodman records and hard-boiled eggs. Soon, aided by sensitive scientist Dr. Hoffstetler (Michael Stuhlbarg) and pals, she hatches a plan to bust the creature free: and Strickland isn’t the kind to pay enough attention to ‘the help’ to see the plan coming. A kind of renegade fairytale romance ensues, though this being del Toro, it ensues in extravagantly wrought fashion. Never mind that the plot points can be semi-predictable; fairytales often are. What’s more vital is the poetic potency with which del Toro frames the transformative, language-leaping bond between a wounded fish-fella and a scarred woman who has, finally, found someone who doesn’t look through her. It also helps that Hawkins is on peak form. In her richest role since Happy-Go-Lucky, she communicates non-verbal feeling with an unforced charm that never dampens the longings below. Don’t let the faint echoes of Amélie dupe you: Hawkins and del Toro ensure her feelings run truer than any burped up in Jean-Pierre Jeunet’s whimsical hit. Jones projects similar forces of feeling through the scales and tactile grunts of the gill-man, his animal nature honoured yet never diluted for smooth consumption. After Universal’s botched monster-movie revivals, this is a monster done right, red of tooth, claw and heart: and should any Blade II fans fear del Toro has gone soft, let’s just say the creature’s hunger observes no pet-based pieties. Also on boundary-busting duty is Spencer, who vigorously channels the spirits of classic Hollywood romance’s barbed best pals – with added knob jokes. And Jenkins brings a worldly-wise poignancy to Giles, whose crush on a waiter sparks a persuasive portrait of period prejudice. That bigotry erupts in Strickland, G-man to Jones’ gill-man. With oiled hair and ominous cheekbones lit from below, Strickland would verge on noir-heavy cliché were it not for Shannon’s seething menace and del Toro’s understanding of his character type. A creature of his Cold War times, Strickland is the American successor to Backbone’s grasping proto-fascist Jacinto and Pan’s full-bore fascist Vidal; he bleeds like them, too. And any hints of Trump-era resonances are, surely, fully intended. The result is a full-blooded fable of outsider love that’s at once timely and timeless, fantastical and forceful, its every tonal swing matched in substance and style. Del Toro’s intuitive direction navigates the tides between matters of the heart and monsters of history with fluid power, buoyed by the swoon and lunge of Alexandre Desplat’s lavish score. Meanwhile, DoP Dan Laustsen’s sumptuous images relish every inch of Paul D. Austerberry’s immersive production designs, from Elisa’s home to the movie theatre below. In one scene, the gill-man stands before that cinema screen, transported. In del Toro’s hands, we know exactly how he feels.